Here is top 5 portion of my All-Time Most Influential Albums. This is part of my personal list of the top 10 albums that has shaped my music taste and changed the way I listen to music in one way or another. Below you will find numbers 5 through 1 accompanied by a short review and reasoning as to why I selected the albums. If you have heard these albums/artists, good for you ! If you haven't, what the heck are you waiting for? Anyways, I became introduced to Blues Traveler my freshman year at IU and was completely blown away by the vocals and range of Popper , as well as the rest of the band and how well they played their instruments. One thing with music that always jumps out to me, I like great music. You may ask yourself what differentiates great music and how do I know what it is? My answer would be any artist or band that plays their instruments (voice included) flawlessly, I consider to be great music no matter what genre or style. 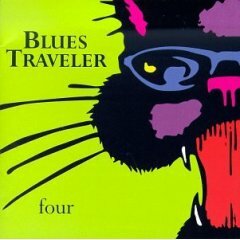 Throughout the album Four, Blues Traveler plays a range of great tunes including the popular Run Around, Brother John, and my personal favorite Hook. For those of you that are skeptics on the whole, "I don't really like harmonica music", do yourself a favor and buy this album or any Blues Traveler album and you will quickly change your mind. You may notice a trend in my artist selection so far, I'm a big fan of early 90's Rock. STP is no exception. I became familiar with STP around the age of 15 or 16 about the same time I did with Foo Fighters. 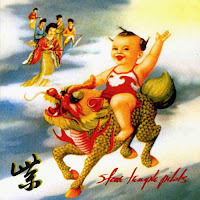 If there is one band I could see in the prime of their careers, I would put Stone Temple Pilots at the top of that list. Scott Weiland produces vocals and lyrics to go with an absolutely awesome musical track for not only Core but every other song the band has made. Many times I find myself listening to STP and think to myself, "What the hell do these lyrics mean", my favorite example of this resides in the song Plush when Weiland sings, "Where you going for tomorrow? Where you going with that mask I found? And I feel , And I feel when the dogs begin to smell her, Will she stand alone?" I have no clue what he means by that but it contributes to my favorite song by the band. Core is a prime example of what Rock should sound like in the 1990's. With songs like Plush, Where the River Goes, and Creep, I can guarantee you'll be banging your head in no time at all. This is the portion of my list where it became very hard for me to choose, therefore I felt the need to make a tie for second place on my list. If I had to pick one artist who's songs seemed to always make me feel good, as if there really wasn't a reason to get worked up about the mundane trivial nonsense that seems to happen every day. That's what all of Jack's music does when I listen to it. I became introduced to Jack Johnson the summer I turned 16 and as you can tell by alot of my previous selections, this was about the age I was really into harder stuff such as STP, Foo Fighters, and so on. That's why it may come as a surprise to see that my tastes go from banging my head to chilling out to the smooth tones of Jack Johnson. For those of you unfamiliar with his work to give you an idea of how chill it is, in Facebook's early days when it was still cool to have, I joined a group called " Jack Johnson is so laid back, he's practically horizontal". Get the Picture? I could not choose which album I thought was better between Brushfire Fairytales and In Between Dreams. 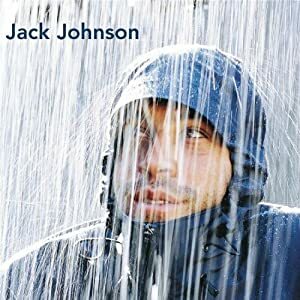 To tell you more about them Brushfire is the first taste I had of Jack Johnson's music and it only took about 1 minute into the first song Inaudible Melodies for me to realize that this guy had something different than I was used to, and won me over right away. Having listened to the album more times than I can count I can still listen to it in it's entirety and not get tired of it. My favorite song on the album is hands down Bubble Toes. With it's da da dada da da, as a fill in for lyrics Jack never wrote, I can tell you the words to the song front to back. 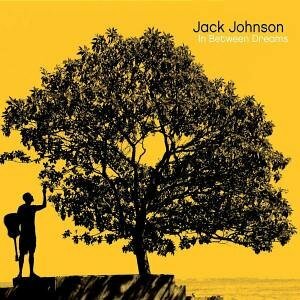 Jack's third album In Between Dreams came along 4 years after his debut album and just when I thought he couldn't come close to topping his Brushfire Fairytales, I heard Banana Pancakes for the first time. The album continued, as well as Jack, to mellow my mood with its easy going lyrics and acoustic sound. Often while listening I would picture myself in Hawaii just sitting on the beach as an attempt to get away from it all. Overall Jack has gained much more popularity over the past decade and I can say I've sort of went along for the ride, these are only two of his albums, but you can't go wrong by getting any of his others either, he just continues to "get it" when it comes to making music. There was a point in my life where I would've told you, "There is no way I will ever like an album better than Brushfire/In Between Dreams". Well I would've been wrong. Three years ago some of my friends asked if I would join them in going to the local movie theater and watch John Mayer's live concert. Reluctantly, I went, having nothing better to do. I had listened to some of Mayer's work, most notably Heavier Things, although I had thought it was good, it was nothing that I couldn't live without. 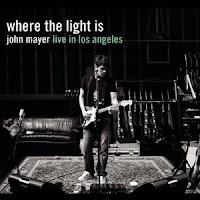 The Where the Light Is album was something completely different than any of Mayer's studio albums. The concert is divided into 3 sets, solo acoustic, John Mayer Trio, and full band. I'd have to say that's what I really like about this album it's diverse arrangement and shear emotion that is included in the live performance. Each set brings with it a distinct sound and a different feel as well. I really enjoy the song Heart of Life, it's unique "slap the Low E" strum on the guitar makes the song roll along with great rhythm as well as great lyrics including my favorite line "No it won't all go the way it should, But I know the heart of life is good". Mayer also provides us with a cover of Tom Petty's Free Fallin, which after listening to it , prefer it over the original. To me what really stands out in this two disc album is Johns ability to mix in some of his hit pop tunes with a steady diet of slow blues, which I think is what he should stick with 24/7. Mayer's ability to play the guitar are often showcased in this album and I highly recommend getting it, and listening to it. I have listened to this album hundreds and hundreds of times and every time I feel myself getting down to Everyday I have the Blues, time and time again.